I am so pleased to have this opportunity to share with you some of the good news in our Department of Earth and Environmental Sciences. Now is a particularly exciting time for our department with a growing faculty, ever expanding labs, innovative teaching, and all the potential that exists within the new Institute for Integrated Science and Society. Let me tell you about some of these happenings. mber of the department. Then, over the past calendar year we have succeeded in hiring two more outstanding faculty bringing our total ranks to 11. That’s a growth of 37 percent over the past few years! Professor Carling Hay joined us this fall after completing a postdoc at Harvard University. 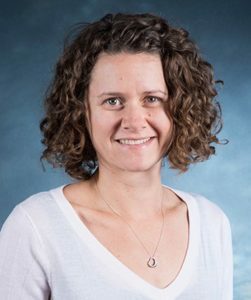 Carling is a physicist by training and has established her reputation on her statistical modeling of sea level rise. Her highly cited 2015 paper, “Probabilistic Reanalysis of 20th Century Sea-Level Rise”, published in Nature showed that global mean sea level rise has been accelerating over the past century which has significant implications for future projections. Carling has worked with Boston city officials on planning for future effects of rising seas in the city. With Carling, and Profs. Jeremy Shakun (paleoclimate & ice-sheets), Corinne Wong (paleoclimate & hydrology), Gail Kineke (coastal oceanography), and Noah Snyder (rivers, dams, floods) we have an unusual strength in the intertwined areas of climate change, ice-sheet stability, sea level rise, flooding, and coastal erosion. Environmental & societal implications abound. This fall, we convened an open panel featuring these faculty to discuss the devastating hurricanes that swept through our nation; the event filled with students and had standing room only. Our most recent hire is still being finalized, so stay tuned for an announcement about that this spring. My own research focuses on the cycling of water, carbon, and heat between the earth’s interior and its surface through tectonic processes. As an isotope geochemist, I use the geochemical record locked inside rocks and minerals to reconstruct past earth processes and conditions spanning billions of years. 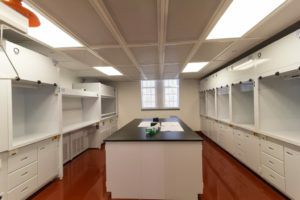 Our new Center for Isotope Geochemistry (completed in 2016 in Devlin Hall) contains rock and mineral preparation equipment, two mass spectrometers, and a 750 sq ft clean lab for the precise extraction and analysis of strontium, neodymium, oxygen, and carbon isotopes in earth materials. These new facilities represent a nearly 3 million investment in the earth and environmental sciences, a strong indication of the commitment our administration has in these areas. The new lab has already attracted visiting scientists from four continents to take advantage of our unique expertise and conduct collaborative research with us. My group is also involved in a 5-year NSF funded project to study ancient subduction zone processes in the Italian Alps. This summer, BC postdoc Paul Starr and BC MS student Anna Gerrits joined myself and about 25 collaborators for a month of field work in Italy to collect rocks that preserve a record of subduction 50 million years ago. Our department has also been heavily engaged in the development and teaching of innovative new courses as part of BC’s “Core Renewal” process. Many of our faculty (Profs. Pisani-Gareau, Kineke, Wong, Ebel, Kafka, and myself) have developed new courses in partnership with faculty in sociology, art history, philosophy, history, education, and theology. With titles like “Global Implications of Climate Change”, “Origins and Evolutions of the Earth”, and “Living on the Water”, these interdisciplinary team taught courses bring out some of the most transcendent themes of earth and environmental sciences for incoming freshman. Interest in these and other introductory classes in our department is at an all-time high; our spring intro-level courses are overenrolled. Outreach to the broader community continues to be an important part of our mission. Under the Direction of Prof. Alan Kafka, Weston Observatory remains engaged in outreach through the BC Educational Seismology Program, bringing earthquake science to local schools. Alan and Visiting Asst. Prof. Shannon Graham have even installed seismometers in Alumni Stadium and Conte Forum, recording the seismic fingerprint of BC athletics (like fans storming the court after BC’s upset win over Duke last week). Several of our faculty (e.g., Ebel, Shakun, Snyder, Hay) have been featured in TV, radio, and print media commenting on matters ranging from earthquakes, to hurricanes, to climate change, to sea level rise, and more. For my part, I’ve been working in local schools giving presentations in K,4,6, and high school classrooms about earth history, geochemistry, and the mineralogy of climate change. 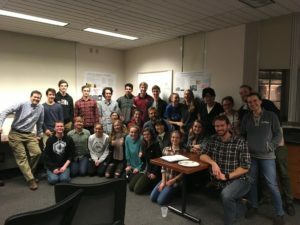 This semester, I ran a high school outreach program called “RoBOT: Rocks Beneath Our Toes” which brings local are high school students together with BC students in my Petrology class in a shared experiential field-based sampling expedition. The RoBOT program culminated last week with a visit to BC where high school students toured our labs, and worked with BC student mentors to tease out the story of each rock they collected in their own community using our microscopes and labs. This is the tenth year I have run this program, now having reached over 130 high school students and over 100 college students. Our department is well placed to be a leading player within the newly announced Schiller Institute for Integrated Science and Society which will focus on themes of health, energy, and environment. We expect to lead with our example of interdisciplinary study of the earth and environment, especially centering on climate, water, and natural resources. The Institute should provide additional space for new faculty and laboratories fostering the kind of collaborative research we embrace as a department. If there is one crucial element we need to maximize our potential, it is the addition of PhD students to our graduate program. With significant increases in NSF grant success, publications, and new investments in faculty and facilities, we need PhD students to help us capitalize on these resources. Our graduate program is already strong, but the addition of PhD students will allow our best graduate students to stay for 4-6 years (rather than just two), permitting them to use their more significant training to undertake and follow through on richer research projects, mentor and teach our undergraduates, maximize our participation in the new Institute, and increase the reach of our department through a new cadre of highly trained graduates. An Institute purporting the focus on “environment” (as well as closely linked “energy” and “health”) will not be credible without PhD level research in earth & environmental science. A major goal of mine as Chair is the establishment of a PhD program in earth and environmental sciences, and I hope to gain the full support of the BC administration to achieve this goal before the new Institute opens its doors in 2021. We are ready. I hope this has given you a sense of some of the things we are working on. I (and our students) would love to hear from any of you about your work in earth, energy, and environmental sciences. Our new department website is still taking shape, so check back to see as new information and features come out. Please feel free to reach out to me anytime, and do stop by the department the next time you are on campus. You will find a young, active, and vibrant department with impressive infrastructure right here in Devlin Hall! Ethan Baxter is a Boston native and lifelong Red Sox fan. Born in New England, he still has rocks and minerals he collected in his neighborhood as a child. He received his B.S. in Geology and Geophysics from Yale University in 1995 and his Ph.D. in Geology from the University of California, Berkeley in 2000. After a two year post-doctoral fellowship at the California Institute of Technology (Caltech), he was a member of the Department of Earth Sciences at Boston University from 2002-2015. In 2011, he was invited for an eight-month sabbatical at the ETH Zurich, Switzerland. He joined the faculty at Boston College as associate professor of Earth & Environmental Sciences in July 2015. At Boston College, he directs the new Center for Isotope Geochemistry. In 2007, he was awarded the Clarke Medal by the Geochemical Society for an "outstanding contribution to geochemistry or cosmochemistry by an early career scientist". In 2011, he was named a Mineralogical Society of America Distinguished Lecturer. And in 2017 he was named a Fellow of the Mineralogical Society of America. Prof. Baxter's research has taken him and his students to field areas including Austria, Switzerland, Italy, Spain, Scotland, the Greek Isles, Ontario, California, and throughout New England.